Author(s): Rodrigues, M.1, de Andrade, E.1, Quedas, F. 2, Fernandes, C. 1, Lopes, A.M.
Abstract: In transgenic plants, the transgene copy number may influence the level of expression and the genetic stability of transgenes but also of protein-coding and/or protein non-coding endogenous genes. Studies conducted on F1 maize seeds showed seldom genetic instability of the transgene and no significant variability on proteins and metabolites profiles. However, a study conducted on segregating F2’s showed transcriptional variation between transgenic and near-isogenic non-transgenic populations. As transgenes have a Mendelian’s segregation, 50% of the F2 individuals are hemyzygotic; 25% exhibit two transgene copies and the other 25% have no transgene. Here we describe a quantification assay for the transgene MON 810 in pollen, as a first step to access F2 segregation, and a non-destructive approach to evaluate the zygocity of F2 grains. Maize endosperm constitutes up to 85-90% of the mature grain dry weight and has a 2:1 ratio of maternal to paternal genomes. Therefore, small portions were detached for DNA extraction and transgene relative quantification whereas the rest of the endosperm and the embryo were preserved at 4 °C for subsequent transcriptomics. Transgene copy number was quantified in relation to an endogenous gene by means of two standard curves constructed from a serial dilution of the plasmid containing the MON 810 transgene and the hmg endogenous gene (ERM®AD413) and using the EURL-GMFF, JRC validated method. 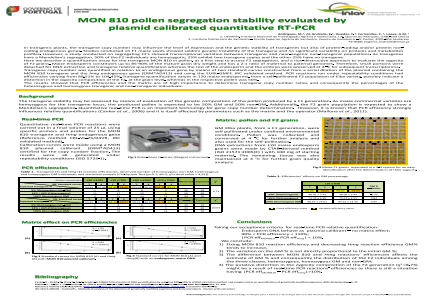 PCR reactions run under repeatability conditions had efficiencies varying from 89.51% to 104.45%. Transgene quantification values in 120 maize endosperms, from a self-pollinated F2 population of Elba variety, possibly indicate a distortion in the zygocity composition of the F2, at the grain level, whereas in the respective pollen was 50%. Transgene stability may be assessed by the genetics of the F1 generation pollen. As maize varieties are hemyzygous for the transgene, the produced pollen is 50% GM and 50% non-GM. Additionally, it segregates in a Mendelian manner. qrt-PCR is adequate for gene copy number determination. However, it is known that PCR efficiency strongly influences relative quantifications (Cankar et al., 2006) and it is itself affected by parameters such as the matrix and the operator (Mallona et al., 2011References: Cankar, K., Stebih, D., Dreo, T., Zel, J., Gruden, K. (2006) Critical points of DNA quantification by real-time PCR – effects of DNA extraction method and sample matrix on quantification of genetically modified organisms. BMC Biotechnology, 6: 37. Mallona, I., Weiss, J., Egea-Cortines, M. (2011) pcrEfficiency: a Web tool for PCR amplification efficiency prediction. BMC Bioinformatics, 12: 404.